There are a number of aspects to our Windows 10 corporate branding / look and feel that I have implemented recently with three main changes involved. Its worth mentioning up front that I’m not using a corporate logo or style however you could easily substitute what I have done with your own images to achieve the same outcome. Setting a default lock screen wallpaper that is consistent with the Windows 10 operating system and the Microsoft color scheme. Removing the default Hero wallpaper that is displayed immediately after a Windows 10 workstation is started prior to logon. Setting a default desktop wallpaper (where required). To achieve these changes I’ve used a combination of Group Policy and Operating System Deployment choices with our Configuration Manager 2012 Windows 10 Task Sequence. 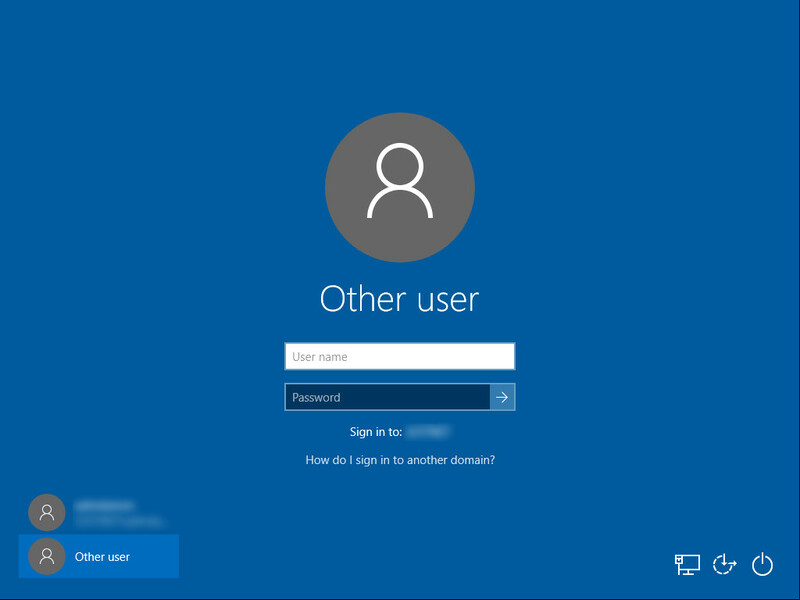 To implement this you will need to add the following to the Group Policy that is targeting your Windows 10 workstations under Computer Configuration/Policies/Administrative Templates/Control Panel/Personalization. Don’t worry about the file not actually being present at the this location, as we are going to use our Configuration Manager Task Sequence to copy the lockscreen image to the workstation as part of the build process. Alternatively you could copy the image file using a group policy preference or even reference the image to a highly available DFS file share (Although I personally don’t like the idea of this for various reasons). 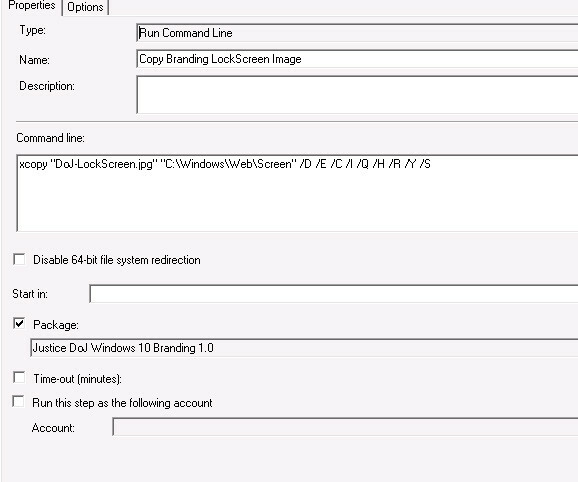 Now that we have configured our Group Policy we need to create a simple package in our Configuration Manager 2012 environment and add a step to our Task Sequence. Create a new folder for your package under your source share. I’ve called ours DoJ Windows 10 Branding but its entirely up to you. Copy your JPEG image to the folder. This image should be formatted correctly for your environment with regards to size. If your using anything other than a solid color, then you may need to have multiple images of various sizes. This blog offers a good way to manage this, but for my blog this is out of scope as I am using a solid color background with a resolution of 3840 x 2160. 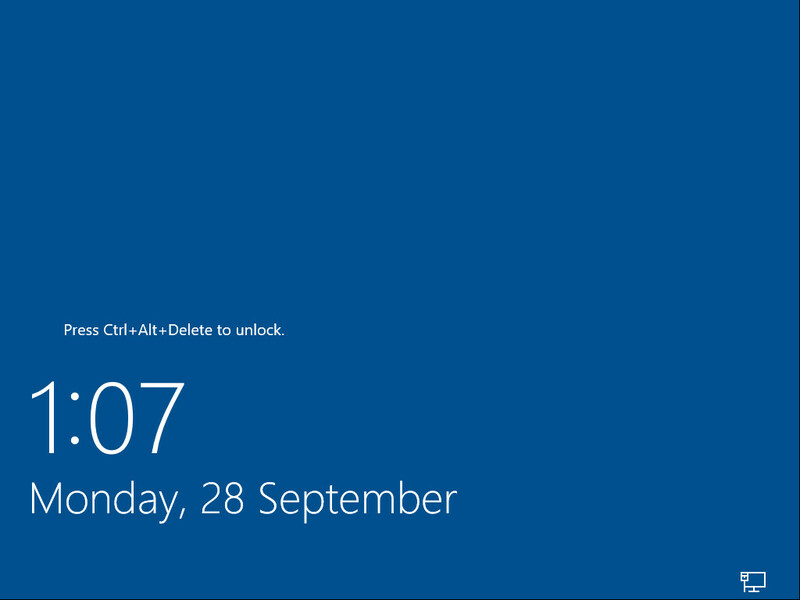 The color I have chosen is the default blue that is included in Windows 10. Create a new Run Command Line Task Sequence step called Copy Corporate Branding Lockscreen Image (or similar) and specify the package details as per below. When you build a workstation now you should now see your custom lockscreen image! Note that there is a small Group Policy bug in Windows 10 which requires you to restart after your Configuration Manager Task Sequence completes. This seems to be related to Windows 10 not applying Group Policy objects even though the SMSTSPostAction variable is set with a restart command. I’ve seen quite a few ways of implementing this, but basically it comes down to a registry change which set the value of HKLM\SOFTWARE\Policies\Windows\System\DisableLogonBackground from 0 to 1. My preference is to do this during the Operating System Deployment process, but again this change could be implemented by Group Policy or as an additional step in your Task Sequence i.e. executing a reg add command or merging a reg file. I’ve found that using unattend.xml for this process is quite effective and simple. It also has the added benefit of reducing administrative overhead that the other solutions offer. Open your unattend.xml using Windows System Image Manager and add the following to your specialize pass from the amd64_Micorosoft-Windows-Deployment_neutral component. Please ensure that the order value is 1. In the screen captures my order value is 2 because I am applying an additional registry key change which is not relevant to this blog. Save your unattend.xml and replicate the package so your Task Sequence uses the updated version. Now when you deploy your reference image this registry change will be added. Please note that again, you may need to restart your workstation after the Task Sequence has completed for the change to be effective. Again with this change I’ve chosen to leverage Group Policy. We have a small group of workstations that require an enforced background. Set Desktop Wallpaper to Enabled and specify the location of your image file. 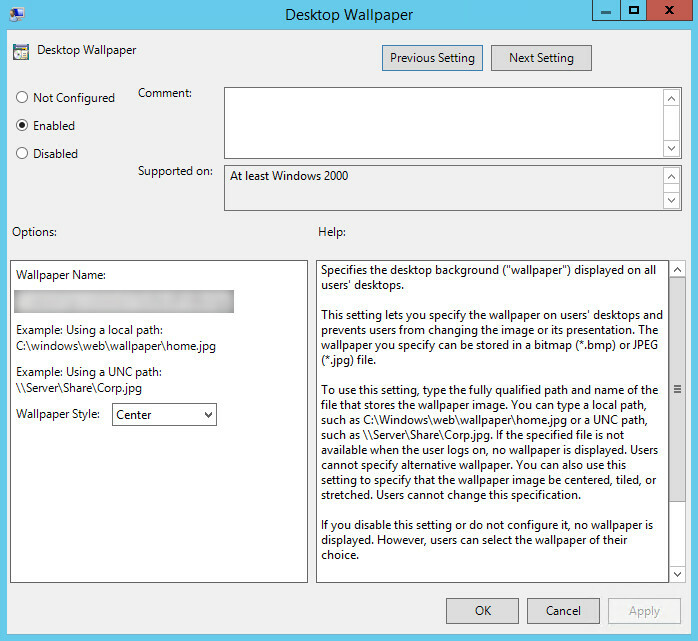 You could add an additional step to your Configuration Manager Task Sequence to copy the image file to c:\windows\web\wallpaper\yourcustomwallpaper.jpg however in my case as its only a small subset of workstations, I’ve pointed the group policy to my Distributed File System. I hope this blog helps those of you looking to implement some changes to the default appearance of Windows 10.